Response: MRI offers high-resolution fetal images with excellent contrast of tissues. It can generate detailed characteristics of many parts of the fetus body as the face as well internal body structures as airways paths, central nervous system and abdomen. When US give unexpected results, MRI can be used, because it can provide additional information about fetal structure. Three-dimensional (3D) virtual modeling has gained great momentum in recent years, due to the high performance of software applied in the fields of engineering, architecture, and design. 3D virtual and physical models produce a new visualization to improve understanding and knowledge of congenital anomalies. It has also shown to enhance the parental bonding process. The construction process of the 3D accurate virtual model starts with the 3D modeling volume built through the US and/or MRI, followed by the segmentation process when the physician selects the important body parts to be analyzed that will be then reconstructed in 3D. Having the accurate 3D model the final stage is the programming of the virtual device, which can be an Oculus Rift or headset for cell phone. The navigation through internal paths can be pre-defined by the physician responsible for the patient in order to highlight the main subjects to be studied by the fetal medicine team as well for parents understanding. 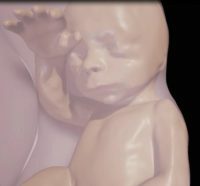 Response: Virtual reality fetal 3D models based on US and/or MRI were successfully generated. They were similar to the postnatal appearance of the newborn baby, especially in cases with pathology such as cervical tumors. 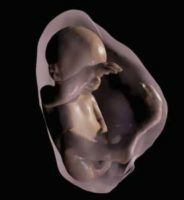 The use of virtual reality fetal 3D models obtained by US and/or MRI may improve our understanding of fetal anatomical characteristics, and can also be used as a method for parents to visualize their unborn baby or for educational purposes. This entry was posted in Author Interviews, MRI, Technology and tagged fetuses, MRI, pregnancy, RSNA16, ultrasound, Virtual reality by Marie Benz MD FAAD. Bookmark the permalink.